Since the last post How old is too old To Exercise was published I haven’t been able to get it out of my mind. There were many comments left on the post and private messages sent to me, about the subject. Of course I don’t think you are ever too old to exercise and it seems that many of you agree with me. Coincidentally, yesterday, Facebook memories told me that it was the anniversary of the day that my friend and I walked 100k in one day from Melb to Sorrento. This wasn’t an organised event. It was just the two of us, one aged 60 and the other 64 walking because we wanted to and because could. This wasn’t a whim. We planned it and we trained for it. This repost isn’t to brag or highlight any sort of greatness. My aim in reposting this walk, is to show that you don’t have to be young, to set and achieve a challenge. Age has nothing at all to do with it. All it takes is commitment, perseverance and a positive attitude. Here is the repost. I hope you enjoy reading it. Finally the day had arrived. The day my friend Nadine and I had been training towards, over the past 6 months. The day we were both looking forward to and the day that I was also dreading. Nadine was calm as the day approached, but as usual for me it was stress, panic and worry that I hadn’t done enough training and wasn’t well enough prepared to take on this ridiculous walk of 100k in one day. This wasn’t an organised walk for charity. 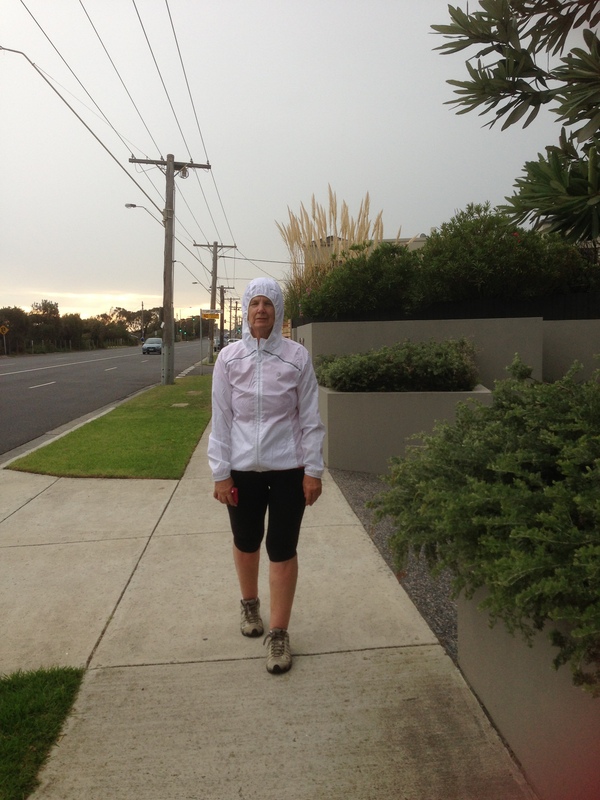 It was just Nadine and I walking from Melbourne to Sorrento. Just the two of us. Walking until we arrived. No sleeping, and very little support. As I met Nadine at the station, my nerves were getting the better of me. During the week before, my training had been not as good as it could have been, and I was doubting myself. Could I do this? Why did I come up with this stupid, ridiculous idea? Would my feet stand up to the pressure? If they didn’t, would I be able to take the pain? Would I have to pull out? This was the scariest thought of all. Until now, pulling out just wasn’t an option. I would be letting myself down, but worse than that, I would be letting my buddy Nadine down. All of these thoughts were running through my head on the train journey to Melbourne. The quicker we got this nightmare started, as far as I was concerned, the quicker I would know my fate. Soon after saying goodbye to Tina, my gorgeous cousin Paul turned up to give his encouragement, and walk a short distance with us. Paul is a huge support for me. It seems that no matter what little adventure I get up to, Paul arrives to support and chat. Thanks Paul, your support of me is appreciated more than you could know. Heading along Beach Road we were horrified to see this old dog standing in the middle of the road, obviously confused and lost and trying to avoid the heavy traffic to cross the road. His tag told us he was Fergus and his phone number, so we called his owner and left Fergus at a house nearby until his Dad arrived to collect him. Fergus was adorable and such a cutie. Meeting him was a highlight for both Nadine and myself. During the middle of the afternoon there was just a short patch of rain. Just a couple of very light showers and nothing at all to worry about. The showers soon cleared and the coat came off. We were so blessed with the weather. The Gods certainly were smiling down on us. We walked right through the night in short sleeves with just a light spray jacket. This was a surprise to us, as we had expected the night to be a bit of a challenge due to the weather. 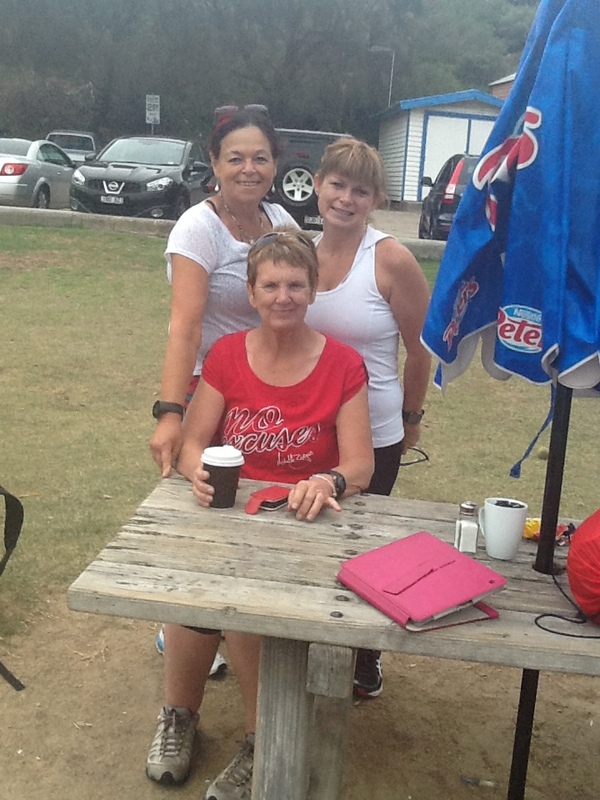 In the late afternoon the Bendigo 12wbt girls, Sue, Yvette, Pip and Tania turned up. And of course Tania’s buddy, Drew, the sweetest little dog ever, was there to spur us on. Nadine and I are so so grateful for these girls for driving to Melbourne specially to bring us warm clothing. As it turned out we didn’t need the warm clothing, but it was great to dump our extra gear in their car and continue on with lighter packs. Tania and Yvette walked quite a few ks with us, which also helped to pass the time. As dark fell we waved off this happy bunch, of ever laughing gorgeous friends. The photo below is very poor but I think shows the fun that was being had. We will never forget what you did for us, girls. You’re amazing friends. We hit the halfway mark at Frankston, at about midnight. We both felt fantastic at Frankston, and weren’t suffering at all. A little voice in my head was telling me that yes we could do this, and all doubts were banished. We just needed to power on to the finish. Actually as we set there pondering our progress, we couldn’t stop smiling. Everything was going according to plan so far. Frankston was a longish stop, as we intended to continue on non stop to Rosebud. 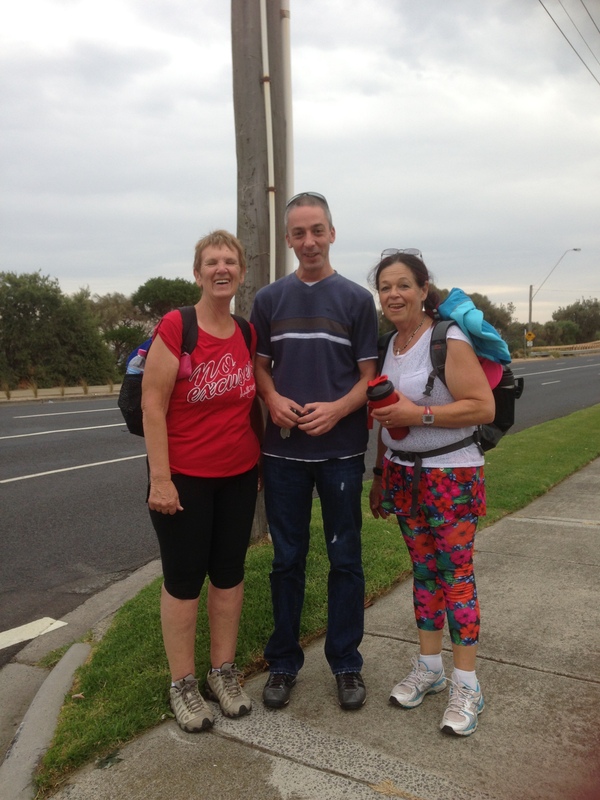 From Frankston we walked along the edge of the Nepean Highway. In retrospect, this probably wasn’t one of my best ideas, but we considered it to be safer than the dark and secluded walking trail along the beach. As planned, we walked non stop to Rosebud. This took about seven hours. Rosebud was our breakfast stop. So after a longish stop, we had 14k to go to Sorrento. I really felt every step after Rosebud. Not physically but mentally. My feet and body felt good but I just wanted to stop walking and lie down and sleep. Nadine was powering on. It seems she got her second wind at Rosebud. Eventually we found ourselves at Sorrento. We had walked 102.5k Our time was 27 hours, 23.5 hours walking and 3.5 hours rest. We caught the ferry to Queenscliffe where we were being met by family and friends. The ending was a bit of an anti climax. I think in our planning, we hadn’t considered the finish and how we would celebrate. We didn’t dare look that far ahead. It wasn’t until a couple of days later that I realised we had achieved our amazing goal and didn’t even celebrate it. We are going bushwalking in the Blue Mountains in a couple of weeks with a group of friends and there will be celebrations. We need to pat ourselves on the back. I’m amazed, not so much that we did it, but that we did it so well. Both Nadine and I had no foot problems at all, and pulled up without a single blister between us. So the question everyone seems to ask me is would I walk 100k again. No I would not! Not ever! I’ve done it now. It’s crossed off the bucket list and I see no need at all to do it again. It’s not that we suffered badly, but mentally it’s a tough ask to walk 100k. However, the main reason for my not ever doing it again is the training. The need to walk and walk and walk, just did my head in. I put the bike away about 10weeks before the walk so I could concentrate on walking. I walked every week day for 2 hours and 5-6 hours plus on the weekends. The training caused huge impacts to my life. I was constantly stressed about it, and wishing I had time to do more, but at the same time I worried that I was over training. Also there was a huge impact on my family. Over the past couple of months, I’ve had to be selfish and focus on me. This has impacted on relationships in my family. Some family members don’t understand why I’ve had to keep to myself more than usual. Now that the walk is over it’s time to try and do some healing there. So all I can say is don’t be afraid to set big goals. The first step is to set the goal, then plan out your training and anything is possible. If the two of us who are aged about 60, can do this, then anybody can do anything. Wow what an amazing accomplishment! I can understand not wanting to do it again. 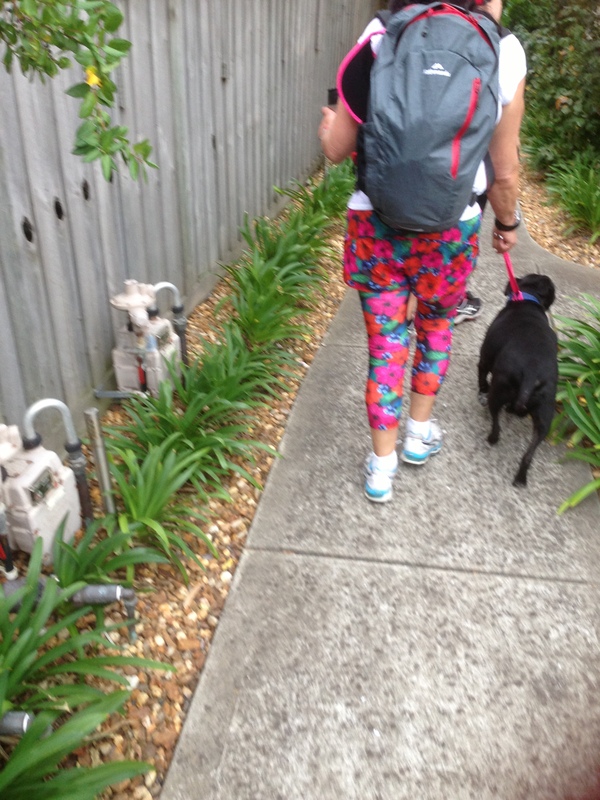 I walked Kokoda when I was 48 and people ask me if I’d do it again. My answer is no, I’ve done it once and don’t need to go through the training and effort again. I enjoyed it at the time but as you say the training impacts on your life. Well done Jennifer and yes you don’t have to do a repeat performance. What I really love about the post is that you and your friend weren’t doing it as an organised event. You were both just doing it! It must have felt great to have some support along the way. I’ve just signed up for the Bloody Long Walk which I am hoping to run. Last year, I trained for it as part of my 60th birthday celebrations only to get pleurisy the week before. I still went but could only manage 25km. This year fingers crossed! You are never too old to do anything you put your mind to. A wonderful message from you and thanks for linking up and sharing with us at #MLSTL. Have a great week! Such an amazing accomplishment, Jen and your friend Nadine! Thanks for sharing your story. I’m visiting from MLSTL. That was a really interesting read Jennifer – especially about the aftereffects and how it all impacted on you and your family. What I really loved about the story was how your friends joined in for parts of it to encourage you both. That was such a lovely gesture and would have made the walk so much better for you both. I didn’t realize the training would be so heavy but then I have never walked more than a couple of miles. Good job. I am so impressed with your accomplishment, and also your honesty in sharing your fears and concerns with this undertaking. 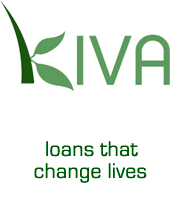 You are living proof that anything can be accomplished, at any age, with determination, planning and perseverance. I love the way you are always challenging yourself physically and mentally. What’s next for you? Impressive. All the more so since it wasn’t an event with support and medals. I am so amazed at this! What an accomplishment. You should feel so proud. I know that I need to push myself harder in the exercise department. I do walk most everyday but nothing like this! Congratulations.